Home > Ask Our Experts > Private Car Park: Can I Be Fined for Parking Over a White Line? I was parked over a white line in a private car park and have received a photograph of my car and a fine for £45 in the post, is this legal? Recently there appears to have been a spate of incidents where motorists have been complaining about being fined for parking mere inches over a white line in a car park. The legal issues surrounding such fines can differ dependent on whether the car park is privately owned, public, or of course whether the car is an obstruction. It also varies dependent on which company you've received the fine from. Around 3.4 million PCNs are issued in the UK each year, yet most drivers aren't fully aware of the law when it comes to which parking fines they must pay. There are a number of different reasons you can be issued a parking fine, but ultimately there are also a variety of ways of contesting the parking fine. Knowing how to appeal your parking fine could lead to you not having to pay at all, with around 60% of appeals being upheld generally. If you're looking to appeal your ticket and hopefully have it rescinded, consider the grounds you've been given the ticket on and whether there is concrete evidence that you've broken the law. 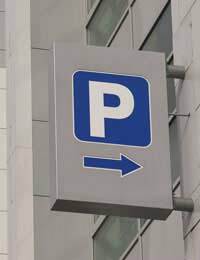 Parking Outside a Marked Bay – If you've received a ticket for this offence, you must ensure that you check the parking space met the minimum width which is currently 1.62m wide. This is measured from the outer edges of the white lines. If you think that you can appeal based on the fact the space isn't marked correctly, or is too small, do so. Private Company Tickets – If you've received a ticket from a private company, this is different to a ticket from a local authority. When you get a ticket from a private company, such as NCP or your local supermarket, there are ways to avoid paying the fine, although they are legally entitled to charge you. Only the driver can be subject to a fine from a private company, so you may be able to claim that you are unaware of who parked your vehicle the day the fine was issued. Also, they may threaten you with legal letters stating that they will take you to court. On most occasions this doesn't happen, but if they can prove that you breached your contract with them (by parking outside a bay for example), they may pursue this. Is My fine Legal or Should I Appeal? Ultimately it is up to you whether you want to simply pay the fine or appeal it. If you've parked outside a marked parking bay in a private car park, they are entitled to serve you with a fine notice and request payment. Usually you can get discounts for paying early, but be aware that the longer you refuse to pay, the higher the cost may be. If the private car park insists that they have proof of your offence, they can take you to court and will require you to pay their court fees. Most don't go this route however as it's lengthy and expensive and some may consider a reduced fee. If you're still not sure whether to pay the fine, speak to a motor lawyer who can have a look at the exact offence, the photographic evidence and then advise you on the best course of action. @505chris - 'the rules is the rules' - you can try to justify what you did, but if you parked so as not to allow another car space to park then you can expect to be fined, regardless. I got fined for being over the white lines and I admit I was but I have a two door car and most spaces don't allow for that making it hard to get in or out. Besides that there was hundreds of unused places. Was it that bad really. Oh and I parked at the very end of the car park out of the way. @Tillypegs - I hope the other person was fined too. I suppose the car parks have to keep some sense of order and I suppose when they are issuing a ticket they don't know which person parked over the line first. But I can completely understand your annoyance. I was ticketed because I parked nexed to a very large 4x4 and had to park slightly over the line to be able to get out of my car! Straddling the white lines can be a parking offence if there is a specific mention on the sign in the car park. This can be appealled on receipt of the ticket, which allows the company a second opportunity to assess the situation on a case-by-case basis. I can only suggest you write to them stating your position. You may not get the money reimbursed now the fine has been paid, but it's worth a try. What's going on when they a private parking firm put tickets on your car for Parking outside a marked bay over a white line, but it was not impeding any one els in a private car park and you the person live there. The trouble is that I read all this advice about not paying fines and then I have now had to pay triple the amount of the original fine as I have received what appears to be a court summons. I think the motorist is v disadvantaged not knowing the law and how it stands on how much a private parking company should charge. Why is the motorist not given this information or made aware of his rights as to how much he can be charged? The only reason I decided not to go to court was for that reason. I didn't know the law on how much the fine can be and whilst I thought it was ridiculously expensive, I am a teaching assistant and can ill afford to lose. I'm just amazed that the government doesn't give the motorist more information on this, as I think its a criminal act on behalf of parking companies to be allowed to charge ridiculous amounts of money for fines. yet they have all the power having legal experts.. unlike the motorist.